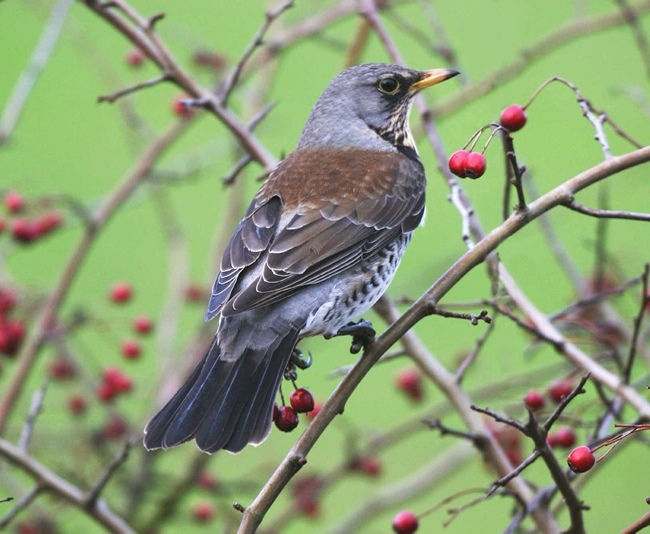 The methodology of the survey is fully documented in the Winter Thrushes Survey Instructions, which can be downloaded from the Resources page. The only important change for the second winter is that we are collecting data only for thrushes, Starling and Waxwing and not for any 'additional species'. The summary below gives a flavour of the survey and how it operates. All observers are reminded of the need to obtain permission to cross any private land, and to follow the BTO's Health & Safety guidelines. Observers are invited to register sites for the survey, using the survey's online data-entry pages. Sites are based loosely on 1-km squares of the Ordnance Survey British and Irish national grids. You can choose a site anywhere in the UK, Isle of Man or Channel Islands, in a place where you can set a route for a winter walk of 1–3 km (c0.6–2 miles). BBS observers are welcome to use their BBS squares and transect routes as Winter Thrushes Survey walks – provided that this will not affect their normal BBS spring surveys. It does not matter if the square you wanted has already been chosen by someone else: more than one observer is welcome to contribute data from the same nominal square. Some squares ('core squares') have already been selected randomly, by the survey organisers, for synchronised midwinter visits ('core counts'). The BTO's Regional Reps will be directing observers towards these core squares. We urge keen observers to volunteer their services to their RR for this part of the survey and to be prepared to cover potentially awkward squares. All core counts will be valuable in the survey's second winter, whether or not a core count was made in that square in winter 2012/13. The route.does not need to be confined to the nominal square but it and the area covered must all lie inside a buffer zone 1 km wide surrounding the nominal square. The map you draw will be applied to all the WTS visits you make to that square, across both winters. If you are repeating a survey and need to change the route, please contact us first to discuss options. Any habitat is fine, provided that you can expect to observe some thrushes feeding at any time during September–April. Walks that include a variety of habitats are ideal. Surveyors are asked to walk along their chosen route, recording all thrushes seen along the route, and collecting information on the location of each sighting, key habitat features and food resources associated with each thrush or flock of thrushes detected. There is no general habitat recording and no habitat recording where no thrushes are detected. Please walk the whole of the route you have set on each WTS visit that you will be entering to the database. The 'core' sites need to be surveyed during the specified midwinter period (27 Dec to 10 Jan). Both the 'core' and the self-selected 'free' sites can be visited as often as you wish during the season (mid September to mid April). About once a month would be ideal, to allow some turnover of birds between successive visits.
. The procedure for recording is to place a numbered marker on your route map every time you encounter a thrush or group of thrushes. Against each marker number printed on the Field Sheet, you need to record the species and number of birds that are relevant to that marker, and detail their habitat and behaviour. Simple categories for recording habitat and behaviour are listed on the Field Sheet. Once you have collected your data, the final step is to enter it all online, using the survey's specially designed web application. First, you will need to log in to the BTO's online surveys (or register if you have not contributed to our online surveys before). The Winter Thrushes Survey site (or sites) you have chosen or agreed to cover will be listed for you with their nominal 1-km references. Choose the site and begin entering your data. The aim is to copy the exact positions of all the labelled markers from your field map to the map on the screen, and to enter the details of species, count, habitat and behaviour for each marker from your Field Sheet into the recording boxes provided. This will enter the full details of the birds and their positions directly into the survey's online database.